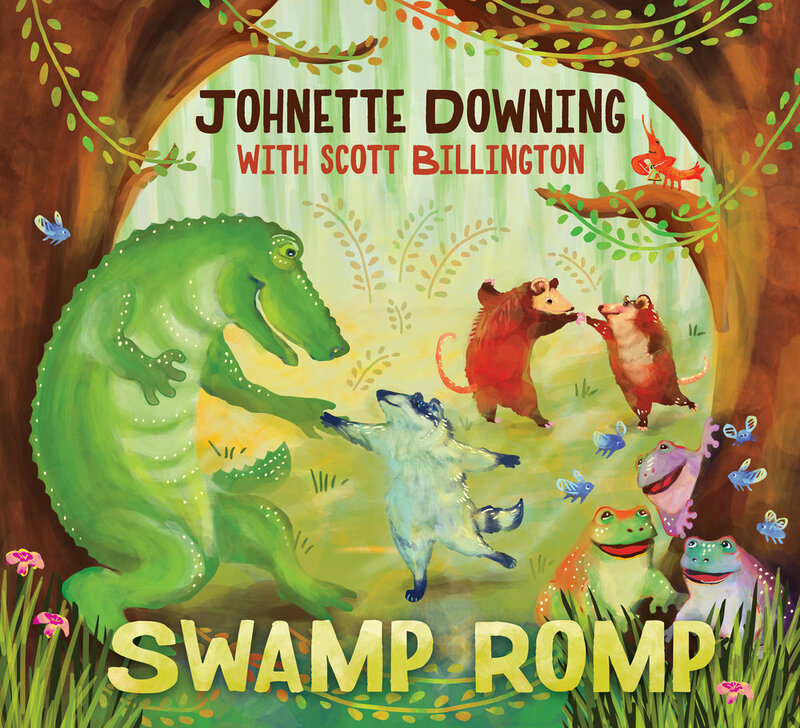 “Swamp Romp” is a new family album by musical artist Johnette Downing that is heavily inspired by the sounds of New Orleans. Johnette Downing, a multi-award-winning and internationally touring musician, author, and former educator, is excited to release the album on February 15, 2019. This festive “Louisiana Dance Party” is Downing’s first project with partner Scott Billington, a three-time GRAMMY Award-winning record producer and musician, and it featured a stellar array of Louisiana musical talent. Five years in the making, and debuted publicly at a recent GRAMMY Museum concert, this record is an homage to the place, people, music, and culture that both Downing (a New Orleans native) and Billington hold dear. A tasty mélange of musical styles is reflected in these fifteen entirely original child-centered songs (and one adapted traditional Cajun tune). The physical album includes 16 pages of lyrics and colorful liner notes, offering teachers and families a useful resource for learning about Louisiana’s rich heritage. Johnette recently discussed this album and its inspirations via an exclusive interview. Meagan Meehan (MM): How did you initially get interested in music and how gold you focus on kids' music? Johnette Downing (JD): I developed a love of music at an early age. As a child, my tuba-and-violin playing father and my saxophone-and-piano playing mother regularly took my siblings and me to the French Quarter in New Orleans, where we would stand in the doorways of clubs listening to jazz and ragtime. My passion for New Orleans music and for sharing it with children, in the way my parents had shared it with me, led to my career as “the Musical Ambassador to Children” and the “Pied Piper of Louisiana Music Traditions” (as media have come to call me). For over thirty years, I have had the pleasure of performing for children on five continents. The 2017 Louisiana Writer Award recipient, I have received twenty-two international awards for my twenty-four books and eleven recordings for children, including a 59th Grammy Award Participant Certificate for singing and songwriting. I have teamed up with my harmonica-playing husband ScottBillington, who shares my love for roots music, to form “Johnette and Scott,” a children’s musical duo. Johnette Downing (JD): Scott Billington's multifaceted career in the music business began when his mother traded a book of Green Stamps for a harmonica, which she gave the 11-year-old as a Christmas present. By the time he was 16, he was performing in New England coffeehouses and clubs. Pursuing his love of blues and roots music, Scott went to work for Rounder Records in the mid-1970s. He has since produced over 100 albums of roots-oriented music for Rounder and other labels, which have won three Grammy® awards and 12 Grammy® nominations. Other awards include the Sweet Soul Music Award (Italy), the Keepin' the Blues Alive Award (Memphis), and the Offbeat (New Orleans) Lifetime Achievement Award. In recognition of his work in Louisiana, Scott was appointed a Louisiana Colonel by Governor Edwin W. Edwards. Scott serves as a Trustee for the Memphis Chapter of the Recording Academy. His performances as a duet with me again bring his harmonica skills to the fore, in our program of roots music for children. JD: We met nearly twenty years ago at a New Orleans music conference, where we immediately recognized our mutual dedication to the preservation of Louisiana roots music. After a long friendship, we married in Italy in August 2013. Making family music together as the duo “Johnette and Scott” came as naturally as breathing. JD: For both of us, breaking into the music scene was organic. Our parents introduced music to us at early ages, and it stuck. By the ages of 16, we were both playing in bands. Our professional music careers started similarly in coffeehouses. In one such coffeehouse, a children’s musician named Judy Stock saw me perform and said, “You would be great performing for children.” That Eureka bell went off in my head, and I knew that this is what I would do for the rest of my life. I worked in an office and then in a law library in New Orleans before taking the giant leap to pursue music full-time. While performing in bands, Scott worked in a record store before landing a job with Rounder Records in Cambridge, Massachusetts. Our careers were a slow steady progress of following our hearts rather than any quick breaks. We believe when you are doing what you love, opportunities to do more of what you love present themselves. MM: What inspired the New Orleans sound of your new album and which songs have the most interesting background stories? JD: I am a New Orleans native; therefore, the New Orleans sound comes naturally to me. It flows through my veins. Scott recorded more than 100 Louisiana roots music albums with artists such as Irma Thomas, James Booker, Johnny Adams, the Dirty Dozen Brass Band, Beau Jocque, Bobby Rush, and many others, and in doing so, became well versed in the history and fiber of the Louisiana soundscape. JD: The “Bamboula Rhythm” song has an interesting story. We try to walk three to five miles per day. On one of our walks, just out of the blue, I started singing, “When you walk down the street, you can feel it in your feet, it’s the Bam-Bam-Bam-Bamboula rhythm.” We stopped immediately, and looked at one another. We knew we had a song. Scott pulled out his phone to record the verse. The bamboula is the underlying beat heard in many New Orleans jazz, second line, rhythm and blues, Mardi Gras Indian, parade and brass band songs today. The beat of the words “bam–bam–bam-boula rhythm” sung in this song on the album teaches children this classic rhythm. Joining us on the song are Roger Lewis, Kevin Harris and Kirk Joseph of the Dirty Dozen Brass Band, who were the progenitors of the modern New Orleans brass band sound. JD: We think there are several standout songs on the record, though we love them all, of course. "Poor Worry Anna" stands out because it is a duet with the Soul Queen of New Orleans, Irma Thomas. Scott has produced several of Irma's records over the past three decades including their Grammy winner "After the Rain." When Irma came to our New Orleans Jazz & Heritage Festival concert, she danced with her grown daughter, and remarked afterwards that she would like to sing on the record. When Irma is in the studio, everything sparkles, and the vocal play between us felt magical. Like grownups, children may sometimes be sad or anxious, and this song is about one of them. "Who Got the Baby in the King Cake" stands out because of the classic Mardi Gras sound and stellar performances by members of the Dukes of Dixieland (Kevin Clark, Tim Laughlin and Craig Klein) backed by Jake Eckert, James Singleton, and Doug Belote, and me. If ever there was a sound of joy, it is Dixieland jazz, and this tune celebrates the culinary centerpiece of Carnival--king cake. Children learn that if they find the hidden plastic baby in their slice of king cake, they are unofficially crowned king or queen for the day, and must host the next king cake party. This custom ensures that king cake parties continue throughout Carnival season. My picture book by the same title offers colorful cut-paper collage illustrations to enhance the lyrical text for children. I will let you in on a little secret! The Queen depicted in book on the Queen’s float is the new mayor of New Orleans, LaToya Cantrell. “Mississippi River” was originally a spoken spelling chant that was used for generations to teach children a challenging Native American word and State name. This song is written in the North Mississippi fife and drum band style. I learned the chant from my mother, but here I expand the lyrics and add music to teach children about the great river. Scott opens the song with a cane fife solo to set the mood. Our friends Derrick Tabb and Keith Frazier of the ReBirth Brass Band keep us in the groove as children enjoy making the shapes of the “crooked” and “hump back” letters into a funky dance. “Mudbug Boogie” pays tribute to the beloved Louisiana crawfish. In many Louisiana dance halls, no musical set is complete without a line dance, and that’s what this mudbug leads children to do. Bassist Lee Allen Zeno (who played in Buckwheat Zydeco’s band for many years) and drummer Doug Belote lock down a groove that will have everyone dancing, while Joel Savoy’s fiddle and Roddie Romero’s accordion add an inimitable dash of South Louisiana flavor. “Bamboula Rhythm” is another favorite because it teaches children the underlying musical beat of the City of New Orleans. We loved this song so much we created a music video complete with the Mardi Gras Indian Irving “Honey” Banister and the second line dancer named Nicole Tate. The video will be released on in February on our Johnette and Scott and my YouTube channels as well as on our websites at www.johnetteandscott.com and www.johnettedowning.com. JD: Our concerts ebb and flow through a nice mix of interactive dance songs, call and response songs, cultural songs, and gentle teachable songs. Children and their grown-ups can expect to dance, sing, clap, think, and laugh across a variety of Louisiana music styles from Cajun to jazz to zydeco while being immersed in a truly authentic cultural experience. MM: What experiences do you hope fans take away from this album? JD: Our hope is to get families dancing together by sharing our rich musical and cultural heritage with them. During special events in Louisiana, one will see multi-generations of people dancing together. Everyone is invited to the dance party, and if you feel you can't dance, don't worry. Someone will pull you on the dance floor and show you how! We also hope to introduce the variety of Louisiana musical styles to families who may not be familiar with them in order to ensure that these regional roots sounds can be enjoyed for many generations to come. JD: Dance with your children! Teach them about your own uniquely rich culture. When one knows and loves ones own culture, one can appreciate and love other cultures. Share with us, and check out our websites, YouTube Channels, and follow us on social media.